Washington • The government shutdown that has halted paychecks for hundreds of thousands of federal workers began its third week Saturday with no end in sight, as Vice President Mike Pence, top White House officials and senior congressional aides met for more than two hours without reaching a deal to reopen the government. Inside the meeting at the Eisenhower Executive Office Building, Pence refused to budge from the more than $5 billion President Donald Trump has demanded from Congress to pay for a portion of his promised wall along the U.S.-Mexico border, according to two Democratic officials briefed on the negotiations. The standoff - which has heavily affected national parks and other operations and threatens to halt payments as varied as food stamps and tax refunds - has made Trump’s unrealized border wall the linchpin of his presidency as he seeks to make good on a signature campaign promise. Administration officials have acknowledged that they were not prepared for the potential consequences of an extended shutdown and Trump's decision to demand wall funding. Democrats, meanwhile, are standing firm on offering no taxpayer money for the project, which Trump had long asserted would be funded by Mexico. Pence was deputized by Trump to oversee Saturday's talks, but he did not have the president's blessing to float new or specific numbers as he did last month in a meeting with Senate Minority Leader Charles Schumer, D-N.Y., according to two Trump aides who were not authorized to speak publicly. That meant few specifics were actually discussed Saturday, as Democratic staffers repeatedly pushed the administration to reopen the federal government and negotiate differences over the border after the shutdown ends. 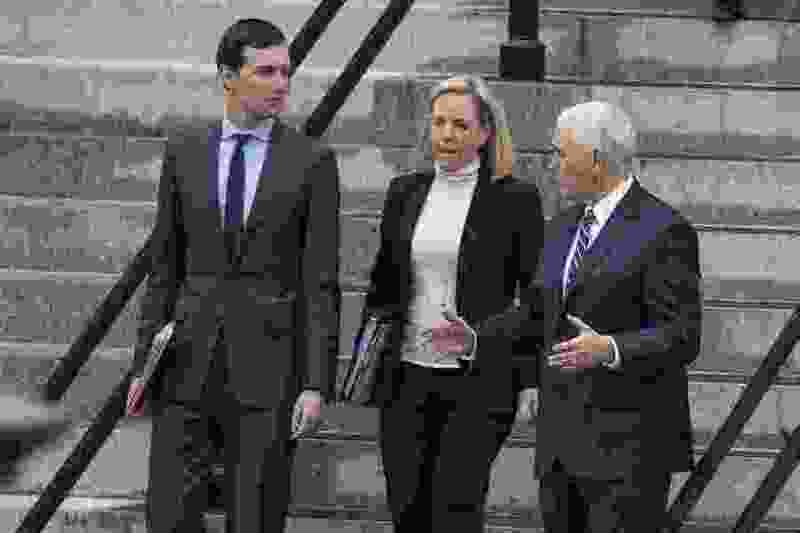 But the administration — represented by Pence, Homeland Security Secretary Kirstjen Nielsen, acting White House chief of staff Mick Mulvaney and senior adviser Jared Kushner — refused, according to multiple officials. "Not much headway made today," Trump tweeted Saturday afternoon. "Second meeting set for tomorrow. After so many decades, must finally and permanently fix the problems on the Southern Border!" Before the meeting began Saturday morning, Trump took a combative tone in several Twitter messages and claimed that news coverage documenting cracks in Republican support for his hard-line position were inaccurate. A number of Republicans, including Sen. Cory Gardner, R-Colo., who is up for reelection in 2020, have said in recent days that the government should be reopened and that a shutdown is not the "right answer," worrying GOP leaders about the depth of support for Trump's position. Trump spent much of Saturday on the phone with allies, talking through his positioning on the shutdown and hearing their reviews of his Friday news conference in the Rose Garden, according to a person close to him. Two people regularly on his call list — Rep. Mark Meadows, R-N.C., and Sen. Lindsey Graham, R-S.C. — have encouraged Trump to hold fast and refuse to agree to reopen the government unless wall funding is secured, the person said. "I've never seen the president as resolved on any issue as he is on this," Meadows said Saturday. "But he is open to new ideas about how to end the impasse." Trump told reporters Friday that he wants to reopen government but is prepared to maintain the shutdown for weeks or even years. He also told congressional leaders at the White House on Friday that he preferred the term "strike" over "shutdown," people briefed on the meeting said. In conversations with top aides on Friday and Saturday, House Democratic leaders said Trump and GOP leaders seem eager to be seen as making progress even if the talks remained stalled, allowing Republican lawmakers back home over the weekend to reassure nervous constituents, according to two Democratic officials briefed on those discussions who were not authorized to speak publicly. "There is the reality of what the White House is doing, which is very little, and the image they're trying to send, which is, 'Look at us, we're busy, and the vice president is rolling up his sleeves,' " one Democratic official said. "They're worried about defections." During Saturday’s meeting, Democratic staffers asked the White House to lay out in formal detail the administration’s funding request for the border — including its specific security requests, what the money would be used for, and what in the Homeland Security budget the administration would cut to make the numbers work, people familiar with the meeting said. Democrats "emphasized that it's important for us to have an updated budget request from the White House because they have been all over the map," said another official briefed on the discussion. The White House plans to provide those figures before the group meets again Sunday afternoon. Some centrist Republicans on Saturday urged Trump and congressional leaders to reopen the government, reflecting growing unease in their ranks about the prolonged shutdown and the political cost the GOP might pay. "With Nancy Pelosi as speaker, it's going to have to be a compromise solution," Rep. Brian Fitzpatrick, R-Pa., a moderate and former FBI agent who represents the Philadelphia suburbs, said in an interview. "It's our most basic function as members of Congress to fund the government, and we need to have these battles on immigration and other issues on their own turf, separately." House Speaker Nancy Pelosi, D-Calif., said in a statement Saturday that the House will begin passing separate bills to reopen the government next week, starting with the funding bill that covers the Treasury Department "so that the American people can receive their tax refunds on schedule." "The senseless uncertainty and chaos of the Trump Shutdown must end, now," Pelosi said. Mulvaney said in an interview to air Sunday on NBC's "Meet the Press" that Trump would "take a concrete wall off the table" in negotiations with Democratic leaders if that would help end the shutdown. "If he has to give up a concrete wall, replace it with a steel fence to do that so that Democrats can say, 'See? He's not building a wall anymore,' that should help us move in the right direction.' " Mulvaney said. But Trump is annoyed by news reports about the negotiations that make it seem that he is backing away from his demands and wants to avoid stories about new numbers for wall funding being discussed, Trump aides said. The president instead encouraged Pence and senior aides to focus on the $5.6 billion for border security that was the focal point of legislation passed last month by House Republicans, the aides said. Trump exasperated members of both parties with his comments Friday, but Trump spent that evening boasting to friends that he was in a strong negotiating position because he was able to capture attention and make a flurry of points that he feels his core voters appreciate, White House officials said. On Saturday evening, Trump tweeted that he would travel to Camp David on Sunday for "meetings on Border Security and other topics" with aides attending a White House staff retreat. He then followed up with a tweet of his "Game of Thrones"-style poster saying, "The Wall is Coming." Mulvaney is spearheading the gathering as a way of connecting with his new deputies and colleagues, according to officials. The president is asking advisers about further ways to battle for wall funding in the coming days, whether it is meeting with family members of people killed by undocumented immigrants, huddling with sheriffs or visiting the border, the officials said. As Saturday's meeting unfolded, Trump was eyeing his own options for trying to force the Democrats' hand, including declaring a national emergency to begin wall construction without congressional approval, a possible course he mentioned at his Friday news conference. According to two confidants of Trump's, who have spoken to him in recent days but were not authorized to speak publicly, Trump is looking at how such a move would play out and has told his aides that such a drastic turn could rattle the Democrats and compel them to offer him wall funding. The legality of such a move is unclear, however, and Trump would almost certainly face immediate legal challenges in the courts. Still, there are signs within the White House that more-comprehensive deals are at least being discussed, more likely for after the shutdown concludes and the government reopens. Kushner, the president's son-in-law, continues to tell his allies that he thinks there could eventually be a deal for border wall funding in exchange for immigration protections for undocumented immigrants who were brought to the United States as children, according to two people who were briefed on those discussions. Another person familiar with the discussions emphasized, however, that Kushner was not pushing for a deal on Deferred Action for Childhood Arrivals, or DACA, at this time. Chatter about an agreement involving protections for young immigrant beneficiaries of the DACA program have risen a bit in recent days, although the administration has rejected previous wall-for-DACA deals and Democratic leadership is in no mood for one now. After his work on a bipartisan criminal justice reform bill, Kushner is as engaged as ever with Capitol Hill, the people said. Still, Kushner’s interest in brokering a possible deal on immigration has caused some anxiety among conservatives close to Trump, several of whom said Saturday they feared the president could eventually be intrigued by Kushner’s position as the shutdown drags on and Trump searches for a way out.